Shoulder impingement and rotator cuff disorders are a common cause of pain and disability for people in all kinds of occupations and activities. For many people, conservative treatment may not be successful and they will need to have surgery to address the condition. It is very helpful to understand what occurs in some of the more common surgical procedures. Acromioplasty is one of most common surgical procedures performed for rotator cuff and impingement problems in the shoulder. Understanding the procedure allows us to better understand the supportive role we may play in the postoperative environment. Impingement and rotator cuff tears occur because of compression of soft tissues against the underside of the acromion process. The tissues that are usually compressed in this area are the supraspinatus tendon, the long head of the biceps brachii, the sub-acromial bursa, the coracohumeral ligament, and the upper region of the glenohumeral joint capsule (see Figure). The tissues most susceptible to compression in this area are the tendons of the supraspinatus and biceps brachii. The anterior/inferior region of the acromion process is the area most likely to compress soft tissues in the region. Compression often occurs in this area because of changes in shape of the acromion that occur with age. 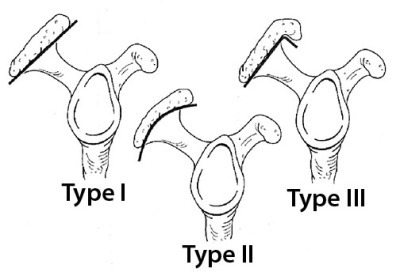 There are three different types or shapes of the acromion that have been identified and they are called type I, type II and type III (image). There are estimates that as much as 70% of rotator cuff tears or impingement occur with type II or III acromions, although no specific causal relationship has yet been determined.1 This would make sense because the anterior/inferior region of the acromion is bent forward in these two variations. A surgical procedure called an acromioplasty is used to treat soft-tissue impingement in this area. The suffix “-plasty” means to form, mold or shape with a surgical procedure. Therefore, an acromioplasty is a procedure in which the acromion process is reshaped through surgery. In this procedure, the surgeon shaves off and reshapes the anterior inferior edge of the acromion process. This may be done either through an open process with a large incision or more commonly with an arthroscopic procedure. Both methods appear to work well, but there are distinct advantages to the arthroscopic surgery, including less operating time, earlier restoration of range of motion, and a speedier recovery. Also, less damage is done to surrounding muscular structures such as the deltoid. Since considerable soft-tissue damage may occur with an acromioplasty, the massage practitioner’s enhanced understanding of this surgical procedure will only augment the treatment process. Massage treatment following acromioplasty can be valuable in speeding the return to full range of motion and the reduction of unwanted scar tissue in the area. 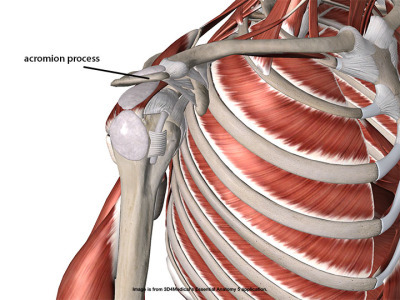 The massage professional may also want to watch for any return of impingement-type pain sensations, because in some cases the acromioplasty may not have effectively addressed the problem and the procedure will need to be repeated. By increasing our understanding of this surgical process, massage therapists can contribute more effectively to the overall healing process. 1. Donatelli R. Physical Therapy of the Shoulder. 3rd. ed. Philadelphia: Churchill Livingstone; 1997.